In the 13 chapters of this slender volume C. Colt Anderson, an associate professor of Church History at St. Mary of the Lake/ Mundelein Seminary, provides ten complete sermons from patristic and medieval preachers as translated by Ian Christopher Levy. The works selected come from St. Augustine (2), St. Gregory the Great (2), St. Peter Damian (2), St. Bonaventure, Stephen Langton, Henry Suso and John Colet. Anderson offers alternative translations for three of the sermons in the appendices (i.e., John Lodge: Stephen Langton; Douglas Martis: Henry Suso and Michael Fuller: St. Peter Damian’s “Exaltation of the Holy Cross”). The work gives an overview of Christian eloquence, highlights advice both from Augustine’s De Doctrina Christiana and from Gregory the Great’s Regula Pastoralis and demonstrates differences between monastic preaching, the preaching of the Schools and Doctrinal preaching of the Late Middle Ages. Because the preacher preaches not himself but Christ Jesus, the author grounds the Christian message in scripture and tradition, which are safeguarded by the Church’s magisterium. He succinctly explains the fourfold sense of scripture and focuses attention on the audience whose needs the preacher must address. 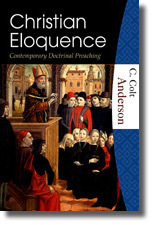 By distinguishing a sermon from a book and a lecture Augustine offers the final counsels I’ll mention. A book can be aimed at a highly intellectual readership; a sermon is directed to a general audience of diverse educational background. Therefore, a preacher should not give lofty sermons to a general audience, wasting their time with matters they cannot understand. Since a lecture can be interrupted and a sermon cannot, the preacher must anticipate the questions of the silent listeners. Regarding monastic sermons, Anderson writes: “Such sermons focus more on a feast day, liturgical concerns, or on the virtues and vices.” These sermons, which were catechetical in nature, provided spiritual guidance and explained the symbols of the liturgy. They were the fruit of men who found a rich source for theological speculation in the puzzling grammatical construction of the biblical text. The doctrinal preaching in the late middle ages used the vernacular in adopting the thematic sermon for the preacher’s purpose. In the one selected from Henry Suso, that purpose is to console people struggling with anxieties; in that of John Colet, it is to provoke people to reform themselves. Some of Anderson’s statements I found discordant. On page 138, for example, he gratuitously denies that St. Francis of Assisi was a deacon and that St. Catherine of Sienna was a nun, implicitly accusing hagiographers of mendacity. He entangles himself on page 12 when he writes: “Passions become vices when they become habitual patterns of behavior.” Passion, however, is neither good nor bad in itself. It becomes good when it is subject to right reason; when it is not, it is bad. Habitual patterns of good behavior are virtues; habitual patterns of bad behavior are vices. These objections, however, are minor. Christian Eloquence is a welcome benefit for the historian and the homilist.